A data record is added to the target data group with this option. A data record in the target data group is modified with this option. A data record in the target data group is deleted with this option. With this option you can decide whether a data group event should be triggered in the target data group. Data group A possesses a data group event, which writes a data record to data group B when a data record is created. 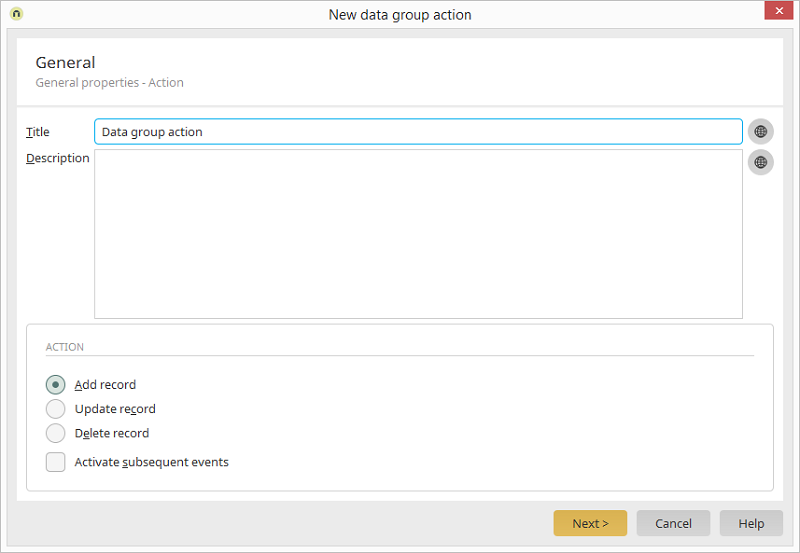 If data group B also contains a data group event, which writes a data record to data group C when a data record is created, the data group event in data group B will only be triggered if the "Activate subsequent events" option is active in data group A. Please note that unintended infinite loops can also be created with the "Activate subsequent events" setting.